PSALMS 96:1 KJV "O sing unto the LORD a new song: sing unto the LORD, all the earth." 1O sing unto the LORD a new song: sing unto the LORD, all the earth. 2Sing unto the LORD, bless his name; shew forth his salvation from day to day. 3Declare his glory among the heathen, his wonders among all people. 4For the LORD is great, and greatly to be praised: he is to be feared above all gods. O sing vnto the Lord a new song: sing vnto the Lord all the earth. Sing ye unto Jehovah a new song: sing unto Jehovah, all the earth. Sing to Yahweh a new song! Sing to Yahweh, all the earth. 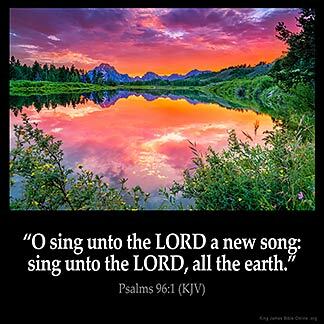 O sing unto the LORD a new song; sing unto the LORD, all the earth. 96:1 O sing - Upon this new and great occasion, not the removal of the ark, but the coming of the Messiah. I believe it means try a different aproach at life instead of waking up everyday with that same ole sad song. Praise the Lord : Praise the Lord : I am made of earth so from all my earth I will Praise Him. He is my God and I will exalt Him. He rides upon the heavens and establisheth the earth : Great is the Lord and greatly to be Praised !!!! !